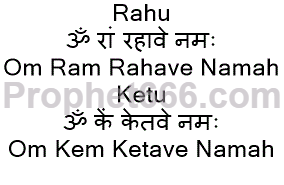 The Graha Shanti Mantras of Rahu and Ketu are given below, the persons having Kaal Sarp Yoga in their horoscopes can chant the Rahu Mantra 18 times and the Ketu Mantra 21 times daily. This Mantra Chanting should be done in the morning after completing the daily chores. Women should strictly refrain for the Mantra Chanting during the Monthly Cycle. According to astrologers some of the common problems arising from Kaal Sarp Yoga are delays, obstacles and roadblocks in the marriages of the girls and boys of the family or not a finding suitable match for them. Lack of progress in job, business, unnecessary expenditure and wastage of money. Chronic illness in the family, a feeling of restlessness and unnecessary and unwarranted fear. Note- Numerous Mantra and other Astrological Remedies and Totke for resolving Kaal Sarp Dosha have been already published on this site. Readers can lookup the Astrology Mantras and Astrology Remedies Sections for these Kaal Sarp Dosha Remedies. Regular chanting of rahu mantra is believed to help in overcoming the aliments related to skin disorders.Chanting of rahu mantra, you can expect calmness, mental peace and you will able to understand the facts and people around you.